This coffee will be fresh roasted for you. We expect Kaldi's Coffee Roasting Co will roast and ship this coffee in 1-2 business days depending on their roasting schedule. The Espresso 700 was blended and roasted for you by Kaldi's Coffee Roasting Co. This is a combination of coffees from Guatemala, Brazil, and El Salvador. 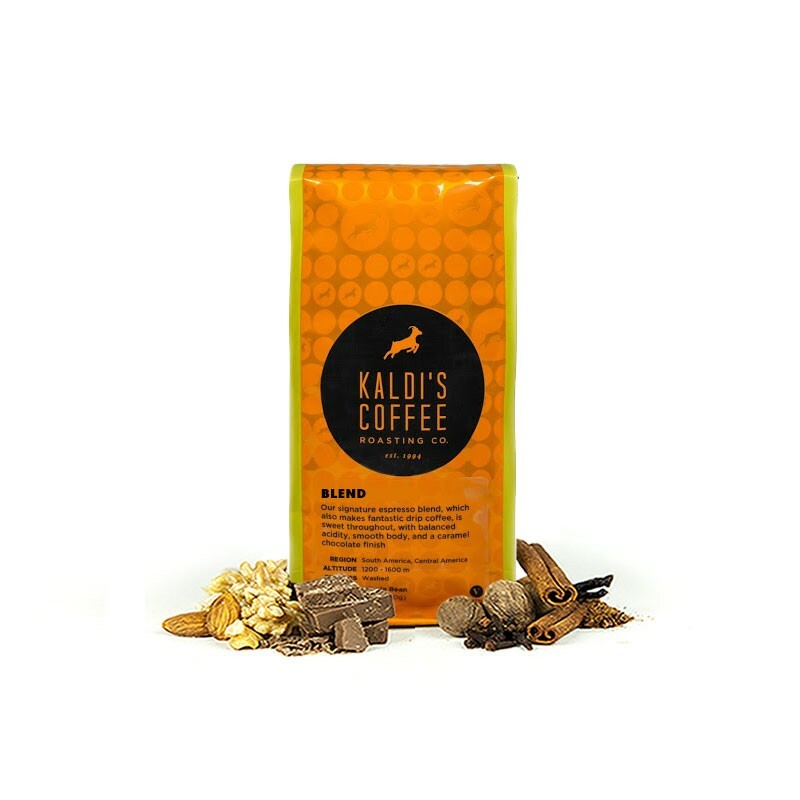 Espresso 700 is Kaldi's signature espresso blend and is sweet throughout with a balanced acidity, smooth body, and a caramel chocolate finish. There is something wrong with the roast and beans. I can’t get any two consistent grinds with this. It’s like I’m rolling dice each time I grind this coffee. The two times I ever got a good grind, it tastes great, but the quality control of this coffee is horrible. Beans are all of wildly different sizes and when I manually tested a few beans, they were all wildly different in terms of brittleness. I’m partial to Kaldi’s as I am from St. Louis and still enjoy going there when I get back to see family. Hard not to like. Excellent! Rich and smooth in French press and also great in the espresso machine. Loved it. Much better than last espresso that was sent. Better flavor but still with a little bitterness. Not as smooth as I'd like my perfect espresso. It was good, but a little mild for me, perhaps I need a darker roast. I used it to make iced lattes & the flavor seemed to get lost in the milk. It was smooth though, with no acidity which i liked. We enjoyed this coffee much more than the first one. I REALLY liked this coffee. I brewed in an aeropress. I like the richness, smoothness, and overall balance. I find that I really don't enjoy coffees that are overly floral (the Frequency Blend seemed to fit into this category of a bit too bright/floral for my tastes). The Anodyne was a good coffee - I'd say that it definitely lives in the "house blend" niche. Of the three I've tasted so far the Kaldi is the clear winner. This hit the spot. Creamy. Complex. I'm a fan. Very nice espresso, rich flavor, made excellent lattes. Love this one. Good both strong or less strong, No nasty aftertaste, easy to drink. A good everyday espresso blend. Once dialed in it's pretty good! Was getting too roasty/bitter flavors, where other coffees would be fine. Pulling 20g dose, 30g yield, 35 secs, 10 days from roast dat and it's like the description. A bit darker than i normally like (e.g. Sermon is one of my favorites, and this is not that) with chocolate being prominent and more roastey flavors (eg spice) coming forth. Although I'm an espresso guy, I can see how this would cut through milk in a latte or machiatto. If you get it and think it's too roasty/dark, back off a bit and it'll start to shine for you. Enjoy. Also a little forgettable, but still made a good shot of espresso. A nice dark balanced coffee. I does not have as an interesting flavor as some of the blends that I have recently had. Full Bodied. Great chocolatey flavor.